The growth of mobile devices continues; it is now estimated there are more than 3 billion mobile subscribers and this number is estimated to rise to over 4 billion by 2010. In particular, the size and growth of the Smartphone market is expanding rapidly and will exceed the laptop market for the next five years, according to a report by market research company In-Stat. What will be the impact of this on corporate learning? Are you ready to leave your laptop home? While 33% of organizations have a mobile learning pilot currently underway, 70% of organizations surveyed are investigating the use of mobile learning in the next 12-18 months. Typical areas of usage include product training, sales training and compliance training, but the overwhelming use is for on-going performance support. There are some issues that need to be addressed, these include diversity of hardware and software, screen size, security and a host of instructional design issues. 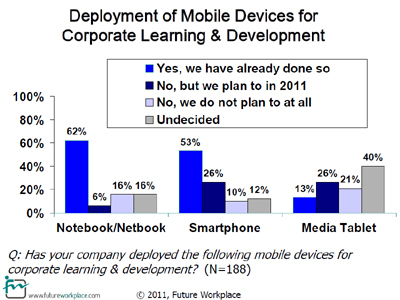 So what are your views on mobile learning? Share your thoughts with me and stay tuned for the date and time of a webcast on this topic.